Clowns are taking over Brooklyn, telling young and old the Great Lag B’Omer Parade is coming to town. You can almost hear the crash of marching band cymbals, and the 12 Torah Pesukim clearly ringing out over a tree-lined Eastern Parkway, New York, thronging with thousands of people. 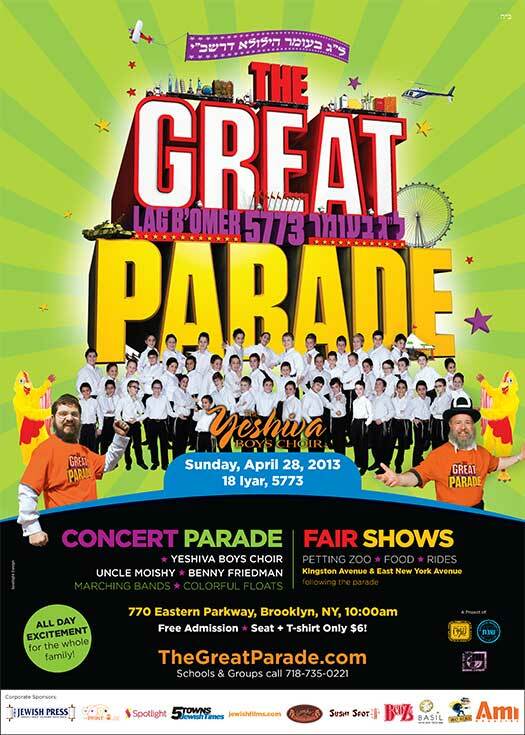 After far too long a wait, this coming Lag Baomer; Sunday, April 28, at 10:00 am; it’s the world’s greatest Jewish children’s event – The Great Parade! Ever the bombastic celebration of Jewish life, this year’s Lag Baomer Parade will include all the enormous themed floats, clowns, jugglers, acrobats and marching bands the Fire Department would allow, along with rising entertainer Benny Friedman, children’s favorite Uncle Moishy, and the world-class Yeshiva Boys Choir. Did we mention the fair, rides, and petting zoo afterwards? Check out the video to get the idea! The Lag Baomer Parade, as part of the extraordinary vision of the Lubavitcher Rebbe, is a tremendous display of Jewish pride and unity for every boy and girl, so make sure to bring along the whole family and have your hearts and spirits uplifted by this special event. While the clowns are busy with their their face-paint and curling irons, make sure to sign up over here to register for the Parade with a group or on your own. You’ll also find some extra information about the Parade, and we’ll let you know more over the following weeks. Tell your friends, and see you there!